The Cooperstown Graduate Program has an award-winning faculty that includes both academics and practicing museum professionals. Both full-time professors and adjunct faculty teach at CGP. Adjunct professors include senior staff from the New York State Historical Association (NYSHA) and The Farmers' Museum, DeNicola Design, and faculty from the State University of New York College at Oneonta. Additionally, dedicated staff in the Program's office and NYSHA's Research Library offer invaluable assistance to the Cooperstown Graduate Program faculty and students. These staff members help with all manner of administrative issues, as well as inter-library loans, reserve readings, and other issues. Dr. Cynthia G. Falk recieved the 2013 Peter C. Rollins Book Award from the Northeast Popular Culture/American Culture Association for her book, Barns of New York: Rural Architecture of the Empire State. "The annual NEPCA Book Prize is named for Peter C. Rollins, a renowned scholar in the fields of American and popular culture and a longtime NEPCA benefactor. It honors a work that the book prize committee feels made a valuable contribution to the discipline in the previous calendar year." The members of the Rollins Prize committee called Dr. Falk's book "a very thorough and insightful mingling of history, architecture, and material culture." Dr. William Walker was awarded an Excellence in Teaching Chancellor's Award in the spring of 2013. SUNY says this about the Chancellor's award: "This award is a SUNY system level honor conferred to acknowledge and provide recognition for consistently superior professional achievement and to encourage the ongoing pursuit of excellence. These programs underscore SUNY’s commitment to sustaining intellectual vibrancy, advancing the boundaries of knowledge, providing the highest quality of instruction, and serving the public good. Through these awards, SUNY publicly proclaims its pride in the accomplishment and personal dedication of its instructional faculty, librarians and professional staff across its campuses." Congratulations to Dr. Walker! 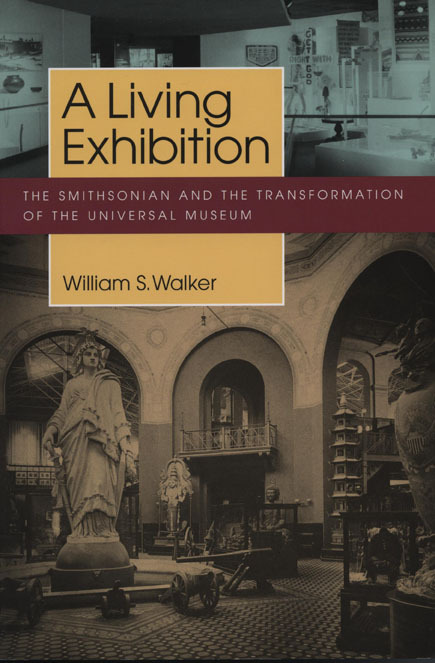 Dr. William Walker's first book, A Living Exhibition: The Smithsonian and the Transformation of the Universal Museum, investigates how the evolution of the Smithsonian Institution has mirrored broader changes in American culture. Since its founding in 1846 “for the increase and diffusion of knowledge,” the Smithsonian Institution has been an important feature of the American cultural landscape. In A Living Exhibition, William S. Walker examines the tangled history of cultural exhibition at the Smithsonian from its early years to the chartering of the National Museum of the American Indian in 1989. He tracks the transformation of the institution from its original ideal as a “universal museum” intended to present the totality of human experience to the variegated museum and research complex of today. Dr. Cynthia G. Falk's newest book, Barns of New York, explores and celebrates the agricultural and architectural diversity of the Empire State. Through descriptions of the appearance and working of representative historic farm buildings, Barns of New York also serves as an authoritative reference for historic preservation efforts across the state. Enhanced by more than two hundred contemporary and historic photographs and other images, this book provides historical, cultural, and economic context for understanding the rural landscape. Through a greater awareness of the buildings found on farms throughout New York, readers will come away with an increased appreciation for the state's rich agricultural and architectural legacy. 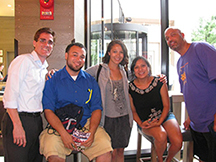 Dr. William Walker with Minnesota Historical Society Fellows, Kyle Parsons, Coral Moore, Natasha Hill, and CGP alum Chris Taylor ('05) at a reception in Washington D.C in 2011.